You say: “For any event P (where P is a label for something happening at a given place at a given time), the events within P’s future light cone make up its absolute future and those within its past light cone make up its absolute past: the former are the events that P can influence and the latter are the events that can influence P.” So as I understood this, it means every two events that are causally connected, must lie in each others light cones (if event A causes event B, then B is in A’s future cone and A int B’s past cone). Events which occur before P according to all observers. Events which occur at the same time as P according to all observers. Events which occur after P according to all observers. Events which can influence P.
Events which P can influence. In classical, Newtonian physics the situation is easy and intuitive. Sets 1 and 4 are the same, and are the past of P. Sets 3 and 5 are the same, and are the future of P. There’s a non-empty set 2, which is the “present” of P. All events other than P fall into one of these three classes. Signals that are as fast as you like don’t change this. In special relativity without faster-than-light signals things are a little more complicated. Sets 1 and 4 are the same, and are the absolute past of P. Sets 3 and 5 are the same, and are the absolute future of P. (People sometimes talk about the “chronological” and “causal” pasts and futures of an event but the use of the word “causal” used in that way would make things even more confusing!) Set 2, though, is empty: there are no other events that all observers agree happen at the same time as P. There is, instead, a large region of spacetime which is not in any of the five sets: events that can’t influence or be influenced by P, and don’t take place absolutely before, at the same time as or later than P.
In special relativity with faster-than-light signals, sets 1 and 4 are no longer the same, and nor are 3 and 5. Sets 1, 2 and 3 are still the same as in the case without faster-than-light signals. The Lorentz transformations only rely on the principle of relativity and the invariance of the speed of light and so faster-than-light signaling doesn’t change the temporal ordering of pairs of events within each others’ light cones. However, it’s fairly easy to see that with FTL signals the sets 4 and 5 become the whole of spacetime! Events in P’s absolute past can influence P anyway. Events outside P’s absolute past or future can influence P via superluminal signals in appropriately chosen frames. Events in P’s absolute future can influence P through the construction shown in figure 5 (although there it’s an event in R’s absolute future affecting R.) Causality is quite hard to define at the best of times but if any other event can influence an event P then clearly we’re very far away from being able to give a conventional description of causal relationships between events. Figure 5 from earlier article The white and blue lines are space and time axes in two inertial frames. The yellow lines are light rays. The red lines P-Q and Q-R are two superluminal transissions. This is the thing that has always confused me and still keeps on doing so. What I would like to see, is the second half of this example: This first half makes assumption that light speed cannot be exceeded (light cones themselves make that assumption), so if this assumption is false, outcome is not reliable. So if someone could prove that FTL implies time travel with assumption that FTL is possible, then we could safely assume that FTL implies time travel. And now little OT. When you (or anyone else) says that “in special relativity faster-than-light travel is not possible.”, do people mean that any kind of movement that appears to exceed speed of light is impossible, or just the kind of movement where you follow certain path, with length s, and it takes time t so that s/t > c? Because I do not understand how causality is broken in case of wormholes. If I had an instant means to get to Alpha Centauri from earth, so that my spaceships “real” speed (traveled distance per time) is slow, even tough it seemed to travel much longer distance, how could I cause problems with causality? I do not think it can be explained with accelerating inertial frames, because I don’t need to accelerate at all, I just pass through a hole with constant speed. Well, in special relativity wormholes don’t exist. To discuss wormholes we really need to get into general relativity, which is a much deeper and more sophisticated theory and one which I don’t currently have time to try to explain. However, in general relativity the universe looks more and more special-relativistic as you look at ever smaller regions, and this means that material objects like spaceships can’t travel faster than light in a general-relativistic universe any more than they can in a special-relativistic universe. There are, though, even more strange aspects of time and causality in general relativity. For example, it’s possible for the sets 1 and 3 in my list above to overlap. This happens for spacetimes that contain closed timelike curves, which is a fancy name for paths along which objects can travel slower-than-light and find themselves in their own pasts. It’s quite easy to see how this works with a pair of wormholes in the approximation in which the wormholes are small so most of spacetime looks special-relativisitic. The key idea is that it’s possible to use time dilation to “age” one mouth of a wormhole relative to the other. Suppose we have two wormholes, each with a mouth at Earth and a mouth at Alpha Centauri. We can then create a situation just like my figure 5. Suppose one wormhole is such that if you enter the Earth mouth at event P you emerge at Alpha Centauri at event Q. We can use time dilation to arrange for the second wormhole to be such that if you enter the Earth mouth at event R you emerge at Alpha Centauri at event Q. So then if you travel through the first wormhole from P to Q you can then travel through the second wormhole from Q to R (i.e. into the past). The system consisting of the pair of wormholes thus contains curves that are both timelike and closed and so collectively make up a time machine. In fact it’s possible to do pretty much the same thing with a single wormhole. Keep one mouth at Earth and send the other out on a long journey at close to the speed of light to some place far away. If you have a clock attached to the mouth that stays at home and another clock attached to the mouth that goes away then the two clocks will remain synchronised if you look through the wormhole. Suppose the journey starts in 2010AD, takes one year of proper time for the travelling mouth and finishes at an event with coordinates 2020AD and somewhere-far-away in Earth’s inertial frame. In 2011 you could then step from the Earth mouth through the wormhole into 2020 in some faraway place. This is quite strange but not much of a danger to causality. However, suppose the travelling mouth makes a similar journey back to Earth. Another year of proper time elapses for the travelling mouth and it gets back to Earth in 2030. However, you could now step from Earth in 2012 to Earth in 2030, or if you’re already in 2030 you could step through the wormhole in the opposite direction to get to 2012. Once again there are closed timelike curves and traditional ideas of causality must be thrown away. Philosophers would probably say that “event A causes event B” is a statement about all possible worlds in which event A and/or event B occur and would get into the concepts of causal necessity and causal sufficiency and the like. Here I’m really talking about a weaker notion of “possible cause”, where “event A is a possible cause of event B” simply means that what happens at event A could influence what happens at event B. Sorry it took a while to continue. Had to do some more reading to overcome the language barrier and to figure out my errors in first post. But I still have to keep on arguing about the diagrams. Am I wrong if I claim that the diagrams are about perception of certain event? Because the truth is that no pure observer can affect the event. If i.e. I decide to blow two bombs in my inertial frame at the same time, no external (pure)observer can delay nor prevent those events from occuring, regardless of their respective speeds. They might perceive those two events happening in different times, and maybe even in different locations, but they still happen. And because we know, that every inertial frame is as good as any other, all interpretations of what "really" happened are based on observers (me or external one) perception. So, this is how I currently see this problem. And this leads to question; Is it not possible that the "time travel" is just an illusion that is caused because we are drawing two different perception in the same picture? So if I am Alice and I send the message to Bob (P->Q), I perceive Carol being distance x away from Bob, but still the Bob gets the message. So in my view, the message went back in time, while Bob perceives Carol being in exact same location as he is in. Other perception is this same idea when message is sent from Carol to Dave and the same perception problem comes. But if you still have time and interest, I would really want to understand this. Disclaimer: I am not a lawyer (nor a physics major). At best, I think that I understand the basics of this thought experiment. 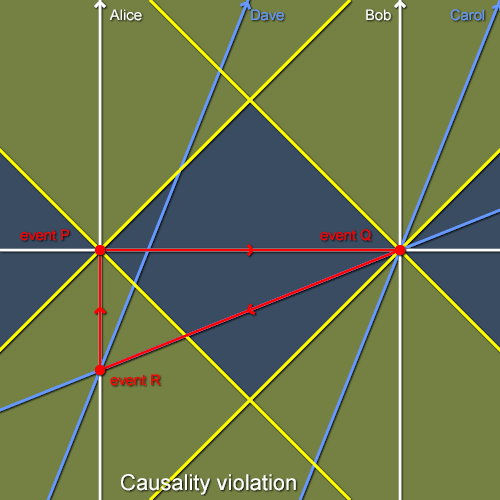 If I do (and if I don't, please, please point out my error[s]), then FTL, special relativity, and causality could be conserved in one special case. Let's take the case of the ship carrying the wormhole. It accelerates to near-light, and so time passes slower there than on earth (though the clocks match up through the wormhole), so that one would move from 2011 AD (at Earth) to 2120 AD (nine light years away). What if the wormhole itself prevents it from coming back to Earth, in a similar manner to the mass gain at relativistic speeds preventing a ship from attaining c? That way, moving wormholes would be a one-way proposition: you could move the endpoints away from each other but never towards each other. In this manner, two events would never violate causality (I think). Let's take a thought experiment for this one before moving on into the more complicated case of multiple wormholes connecting to a common destination. Let's say that we move a wormhole from here to Sirius (about nine light years away). It takes our ship ten years to move the wormhole there according to Earth clocks, while only a single year passes onboard (please ignore the glaring faults in my math for relativistic time dialation; it's one in the morning here, and it isn't going to really affect the parameters of this experiment). So, it is 2019 according to Earth clocks and 2010 according to shipboard clocks. Now, since the Sirians don't like left-footed socks; they're the ones who've been working on that black hole technology to steal them from all of the dryers of the universe. They notice that Joe Spaceman wears one and decide to mobilize their military to come and conquer us in order to destroy our footwear. If they come back through the wormhole, they will arrive in 2019, Earth time. No violation of causality. If they manage to accelerate at a greater speed than Joe's ship, though, would they arrive before the wormhole-carrying ship arrived at Sirius? If, say, they could accelerate fast enough to get to Earth in nine and a half years instead of ten, then would they arrive in 2019 (and a half), or 2029 (and a half)? I suppose that this depends on whether Earth's inertial frame extends that far, due to the wormhole. Does this mean that I'm assuming there is a universally constant frame of reference? I have the sinking feeling that it does, and therefore everything I came up with above is invalid. If so, I apologize for wasting your time. P.S. : I just came up with one possible variation on that idea, though. If the wormhole is required to move at the speed of light (c) until it comes to rest (don't ask me how that would happen, though) relative to its destination, then there is no way for it to violate causality, yes? Or am I still thinking too Newtonianly (is that a word in English)?